Want an online business that helps you turn your passion or hobby into profit? Discover how Australia’s top online entrepreneurs built their online businesses and how you can too. This workshop will give you the skills to take your existing online presence and super-charge it to maximise the opportunities available. For those just starting, the workshop will help you identify the best business idea to pursue, guide you on how to set it up and give you the strategies to grow it quickly using low-cost tools. 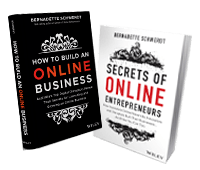 Author and digital marketing expert Bernadette Schwerdt will also reveal how Australia’s top digital disruptors launched their online businesses and how they have created award-winning businesses that are going global. She’ll share their secrets of success so that you can fast track your learning and avoid the errors and mistakes most make when starting out. "Bernadette has been a returning guest speaker for my students in Digital Marketing at Monash University and RMIT University. She has been instrumental in encouraging, motivating and empowering my students for a number of years now. Bernadette's background as a marketer, entrepreneur and author is a great inspiration for my students. She pushes them to think for themselves, and to follow their dreams and passions. She has tremendous insights into what it takes to be successful in an online environment, and she uses current industry examples that are easy to understand and relate. I hope to continue to work with Bernadette in the future so that she can keep being an inspiration and role model for my students."